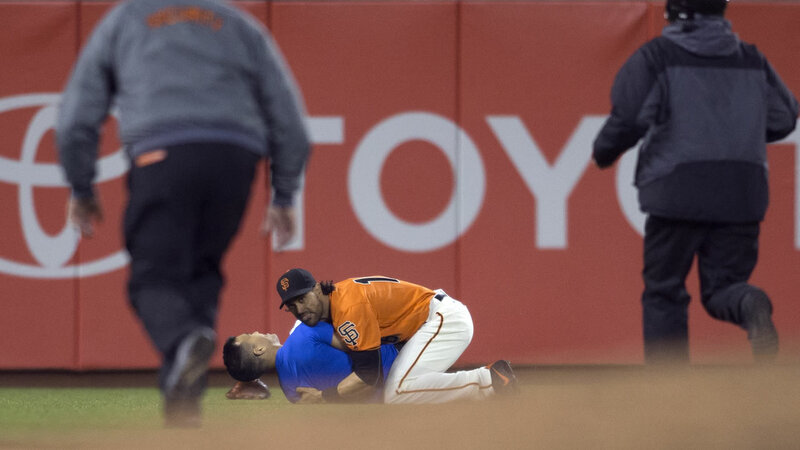 SAN FRANCISCO -- Giants left fielder Angel Pagan body-slammed a male fan who ran onto the field into the outfield grass at AT&T Park during the fourth inning against the Los Angeles Dodgers on Friday night. Another fan - a female - was taken down by security in shallow right field. The two, dressed in Dodger Blue and offering what appeared to be white puffballs, were removed. The male first approached catcher Buster Posey, who with his left arm shoved the man to the ground. The man jumped up and ran and third baseman Gordon Beckham swiped at him before he took off into left field. Pagan offered a hand as if to accept the round white object before throwing both arms around the man, twisting him and throwing him to the ground. Pagan received a roaring ovation from the sellout crowd when the half-inning ended and tipped his cap. An activist group called Direct Action Everywhere says the man who ran onto the field was a protester calling attention to alleged animal abuse at Farmer John, which supplies Dodger Dogs.